For other uses, see Star of India (disambiguation). No appointments have been made since the 1948 New Year Honours, shortly after the Partition of India in 1947. With the death in 2009 of the last surviving knight, the Maharaja of Alwar, the order became dormant. The motto of the order was Heaven's light our guide. The "Star of India", the emblem of the order, also appeared on the flag of the Viceroy of India and other flags used to represent British India. The order is the fifth most senior British order of chivalry, following the Order of the Garter, Order of the Thistle, Order of St Patrick and Order of the Bath. It is the senior order of chivalry associated with the British Raj; junior to it is the Most Eminent Order of the Indian Empire, and there is also, for women only, the Imperial Order of the Crown of India. The Queen, being desirous of affording to the Princes, Chiefs and People of the Indian Empire, a public and signal testimony of Her regard, by the Institution of an Order of knighthood, whereby Her resolution to take upon Herself the Government of the Territories in India may be commemorated, and by which Her Majesty may be enabled to reward conspicuous merit and loyalty, has been graciously pleased, by Letters Patent under the Great Seal of the United Kingdom of Great Britain and Ireland, to institute, erect, constitute, and create, an Order of Knighthood, to be known by, and have for ever hereafter, the name, style, and designation, of "The Most Exalted Order of the Star of India"
The flag of the Viceroy of India displayed the Star of the Order beneath the Tudor Crown. HH Maharaja Shri Sir Vaghji Thakor Morvi State (KCSI) for representing Kathiyawar on the day of Victoria's Jubilee Ceremony given by Queen Victoria for this honor HH Sir Vaghaji Thakor make them Sister. HH Raja Bahadur Bindeshwari Prasad Singh Deo, Raja of Udaipur state in Chota Nagpur States. The Order of the Indian Empire, founded in 1877, was intended to be a less exclusive version of the Order of the Star of India; consequently, many more appointments were made to the latter than to the former. The last appointments to the orders relating to the British Empire in India were made in the 1948 New Year Honours, some months after the Partition of India in August 1947. The orders have never been formally abolished, and Elizabeth II succeeded her father George VI as Sovereign of the Orders when she ascended the throne in 1952. She remains Sovereign of the Order to this day. However, there are no living members of the order. There were only three female members of the Order: Sultan Shah Jahan, Begum of Bhopal and her daughter, Hajjah Nawab Begum Dame Sultan Jahan, and Mary of Teck. The last Grand Master of the Order, Admiral of the Fleet The Earl Mountbatten of Burma (1900–1979), was assassinated by the Provisional IRA on 27 August 1979. The last surviving Knight Grand Commander, HH Maharaja Sree Padmanabhadasa Sir Chithira Thirunal Balarama Varma GCSI, GCIE, Maharajah of Travancore (1912–1991); died 19 July 1991 in Trivandrum. The last surviving Knight Commander, HH Maharaja Sir Tej Singh Prabhakar Bahadur KCSI (1911–2009), Maharaja of Alwar, died on 15 February 2009 in New Delhi. The last surviving Companion of the Order, Vice-Admiral Sir Ronald Brockman CSI (1909–1999), died on 3 September 1999 in London. The British Sovereign was, and still is, Sovereign of the Order. The next most senior member was the Grand Master, a position held ex officio by the Viceroy of India. When the order was established in 1861, there was only one class of Knights Companion, who bore the postnominals KSI. In 1866, however, it was expanded to three classes. Members of the first class were known as "Knights Grand Commander" (rather than the usual "Knights Grand Cross") so as not to offend the non-Christian Indians appointed to the Order. All those surviving members who had already been made Knights Companion of the Order were retroactively known as Knights Grand Commander. Former viceroys and other high officials, as well as those who served in the Department of the Secretary of State for India for at least thirty years were eligible for appointment. Rulers of Indian Princely States were also eligible for appointment. Some states were of such importance that their rulers were almost always appointed Knights Grand Commanders; such rulers included the Nizam of Hyderabad, the Maharaja of Mysore, the Maharaja of Jammu and Kashmir, the Maharaja of Baroda, the Maharajas of Gwalior, the Nawab of Bhopal, the Maharaja of Indore, the Maharana of Udaipur, the Maharaja of Travancore, the Maharana of Jodhpur and the Maharao of Cutch. 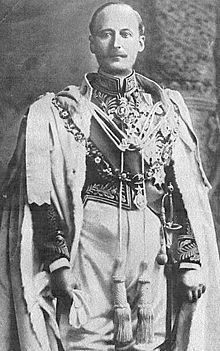 Kashi Naresh Prabhu Narayan Singh of Benares and Sir Azizul Haque were appointed Knight Commander of the Order of the Indian Empire (KCIE) in 1892 and 1941 respectively, Knight Grand Commander of the Order of the Indian Empire (GCIE) in 1898, and Knight Grand Commander of the Order of the Star of India (GCSI) for his services in the First World War in the 1921 New Year Honours. Rulers of other nations in Asia and the Middle East, including the Emir of Kuwait, the Maharajas of the Rana dynasty, the Khedive of Egypt, the King of Bhutan and the rulers of Zanzibar, Bahrain and Oman were also appointed to the Order. Like some rulers of princely states, some rulers of particular prestige, for example the Maharajas of the Rana dynasty or the Sultans of Oman, were usually appointed Knights Grand Commanders. Women, save the princely rulers, were ineligible for appointment to the order. They were, unlike the habit of many other orders, admitted as "Knights", rather than as "Dames" or "Ladies". The first woman to be admitted to the order was HH Nawab Sikandar Begum Sahiba, Nawab Begum of Bhopal; she was created a Knight Companion at the Order's foundation in 1861. The order's statutes were specially amended to permit the admission of Queen Mary as a Knight Grand Commander in 1911. Charles Hardinge, Viceroy of India, in the robes of the Order. The mantle, worn only by Knights Grand Commanders, was made of light blue satin lined with white silk. On the left side was a representation of the star (see below). The collar, also worn only by Knights Grand Commanders, was made of gold. It was composed of alternating figures of lotuses, red and white roses and palm branches, with an imperial crown in the centre. On certain "collar days" designated by the Sovereign, members attending formal events wore the order's collar over their military uniform, formal day dress, or evening wear. When collars were worn (either on collar days or on formal occasions such as coronations), the badge was suspended from the collar. The star, worn only by Knights Grand Commanders and Knights Commanders, included a sunburst, with twenty-six large rays alternating with twenty-six small rays; it was in gold and circular for Knights Grand Commanders, and in silver and eight-pointed for Knights Commanders. 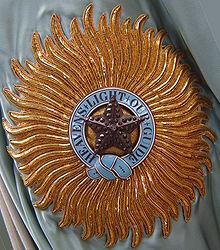 In the centre of the sunburst was a light blue ring bearing the motto of the Order. Within the ribbon was a five-pointed star, decorated with diamonds for Knights Grand Commanders. The badge was worn by Knights Grand Commanders on a white-edged light blue riband, or sash, passing from the right shoulder to the left hip, and by Knights Commanders and Companions from a white-edged light blue ribbon around the neck. It included an oval, containing the effigy of the Sovereign, surrounded by a light blue ring bearing the motto of the Order; the oval was suspended from a five-pointed star, which may be decorated with diamonds depending on class. Unlike the insignia of most other British chivalric orders, the insignia of the Order of the Star of India did not incorporate crosses, as they were deemed unacceptable to the Indian Princes appointed to the Order. Knights Grand Commanders used the post-nominal initials "GCSI", Knights Commanders "KCSI" and Companions "CSI". Knights Grand Commanders and Knights Commanders prefixed "Sir" to their forenames. Wives of Knights Grand Commanders and Knights Commanders could prefix "Lady" to their surnames. Such forms were not used by peers and Indian princes, except when the names of the former were written out in their fullest forms. ^ a b c d e f g h i j k l m n o p q r s t "No. 22523". The London Gazette. 25 June 1861. p. 2622. ^ "Dreamwater Free Web Space". 4dw.net. Retrieved 4 December 2010. ^ "No. 32178". The London Gazette (Supplement). 1 January 1921. p. 5. Proclamation founding the Order of the Star of India, london-gazette.co.uk, 25 June 1861.